Find replacement parts & accessories. It takes a lot of work to keep the outside of your home looking good. Just maintaining the front yard and backyard seems like a full-time job by itself, consider all the mowing, raking, trimming and edging that they require. If you have a vegetable or flower garden, it needs daily attention during the growing season. Then, there are the other things to consider going on outside your home, such if you have trees that need removing, siding or driveways that need power washing, or snow that needs removing. This would be backbreaking work if you had to do the required maintenance by hand. Fortunately, there's a plethora of outdoor power equipment, all of which is available from Walmart, that can make your life easier. Now, you don't have to spend all weekend or your day off working the yard. Thanks to our Every Day Low Prices, everything is affordable, too. Take a look at these power tools for making yard work easier, and get ready to garden. Although you can pay a service to maintain your lawn for you, there's something fulfilling about doing it yourself and making it look like professional landscapers did the work. The main workhorse for maintaining your lawn is a lawn mower. 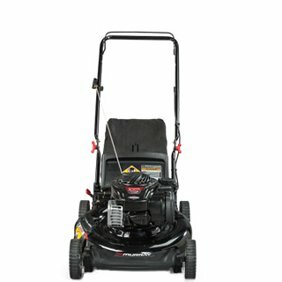 Powered lawn mowers available are gas and electric models. Electric mowers are only available as push mowers, but gas-powered lawn mowers may be the push or riding variety. Electric push mowers are available as corded or cordless. Corded mowers run on powered supplied by an electrical outlet, while cordless models run on rechargeable battery power. Push mowers typically have a cutting width of between 14 and 22 inches. While some push mowers do not supply power to the wheels, others are self-propelled. Both types of mowers have bags that attach to the back, although a mulching option is available. Gasoline-powered push and riding mowers operate on a mixture of gasoline and motor oil and can be louder than electric-power counterparts, which is something to consider if you plan on using them early in the morning or at night. riding lawn mowers are ideal for larger lawns. Most have steering wheels, although some operate with right and left levers. The cutting deck for a riding mower ranges between 20 and 50 inches, with most falling between the 24- and 42-inch range. Most have four wheels, but some only have a single wheel in the front. Riding lawn mowers have an adjustable seat with a low back for getting on and off easily. All lawn mowers have protection devices, such as emergency shutoffs if contact is lost with the user or the blade encounters something hard. Some riding lawn mowers also have bags as optional attachments. All electric power trimmers, edgers and leaf blowers come in corded and cordless versions, and gas-powered equipment is also available. 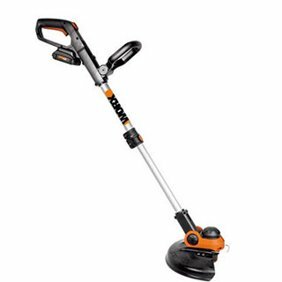 Power trimmers make it easy to trim grass in and around areas that are hard for a lawn mower maneuver around, such as along fence lines and around beds or vegetation. Most trimmers are string trimmers that use spinning cords to trim plants, but you can also find hedge trimmers, which have dual blades on top of each other, that are used to trim hedges and bushes. String trimmers have a large round handle you hold in one hand while you direct where the trimmer goes using the other hand. String trimmers usually use monofilament line for cutting, and that line ends up needing replacement at some point after it wears down. Powered edgers neaten up your lawn where it meets concrete or other hard surfaces such as a driveway or sidewalk. Edgers have two wheels in the back for stability and a single smaller wheel in the front, which allows you to control where the edger goes. There are also some combination trimmer/edgers available, which do both jobs. You can achieve this by simply rotating the trimmer/edger head to the side for edging or flat for trimming. Leaf blowers are also available in electric- and gas-powered models. These have a convenient handle and are lightweight enough to operate with only one hand. Leaf blowers come in single- and two-speed varieties and have attachments that go on the end of the blower for concentrated air power. Some also have vacuum capabilities and come with a bag that attaches to the bottom. Tillers and cultivators perform similar tasks, which is to loosen the dirt in the desired area. This both aerates the ground and makes it easier to plant. These tools also come in gas-powered and electric models, and some do both tasks. Most are designed as walk-behind devices that have a pair of wheels at the back, a pair of blades with angled tines on the front and handles on both sides for better control. Blades range in width between 6 inches and 18 inches, with 10 inches being the most common. Gas-powered snow blowers and electric snow shovels make snow removal in the winter less of a back-breaking job. Snow blowers resemble tillers and cultivators in a way, except that the snow is pulled into a front chute and then blown out to one side or the other. These can be self-propelled as well. Electric snow blowers come in corded and cordless varieties. Electric snow shovels resemble a cross between a standard snow shovel and snow blower; they're more compact, but require more force to push.